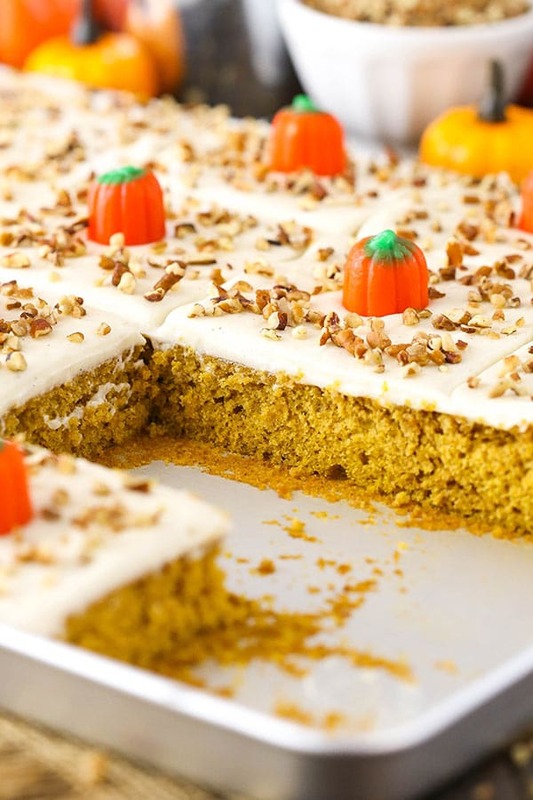 This Pumpkin Sheet Cake is moist, fluffy and covered with a cinnamon cream cheese frosting! It’s easy to make and a perfect dessert for the holidays! So even though it still feels like summer outside and I don’t really want the warm weather to end, I’m totally ready for pumpkin everything. 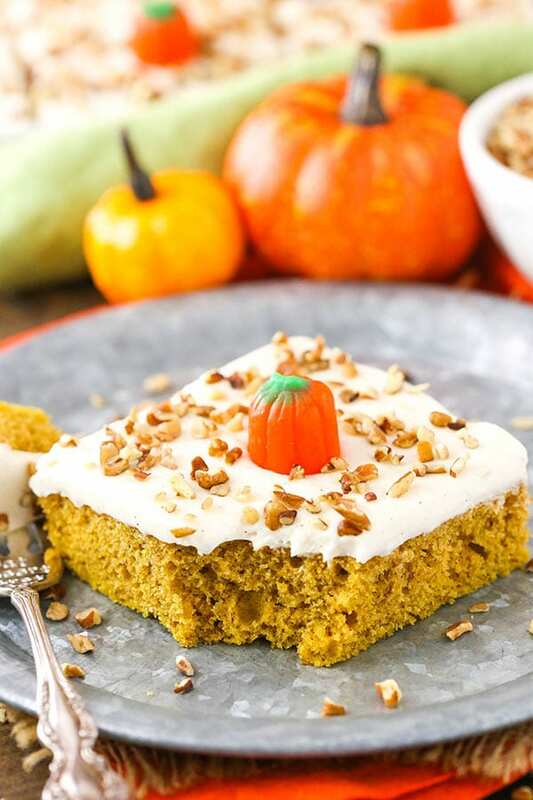 After sharing this Pumpkin Cheesecake on Monday, I’ve now got this delicious Pumpkin Sheet Cake for you and I’m not even sorry about all the pumpkin. In fact, I feel like I’ve been holding back for weeks. Bring on the pumpkin! I think part of the reason I’m so ready for this season is because it’s the first time the boys will experience it. It’s really the best time of year and I’m so looking forward to seeing them do it all for the first time. One of the things I love about this sheet cake is that it’s so great for a crowd. The holidays are all about getting together with friends and family, enjoying time together and great food. 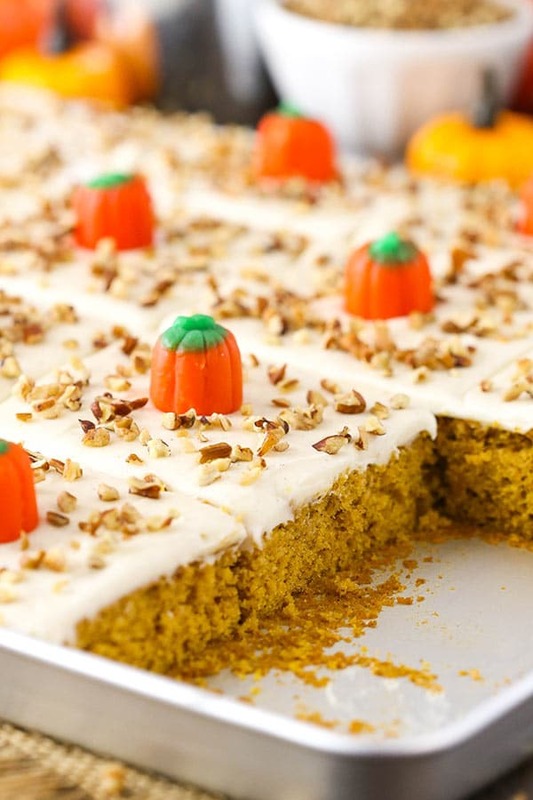 They’re some of the best times of the year and this sheet cake is perfect for sharing. Sheet cakes are also fairly easy to make, as far as cakes go. And during a busy fall and holiday season, that’s often what we need. 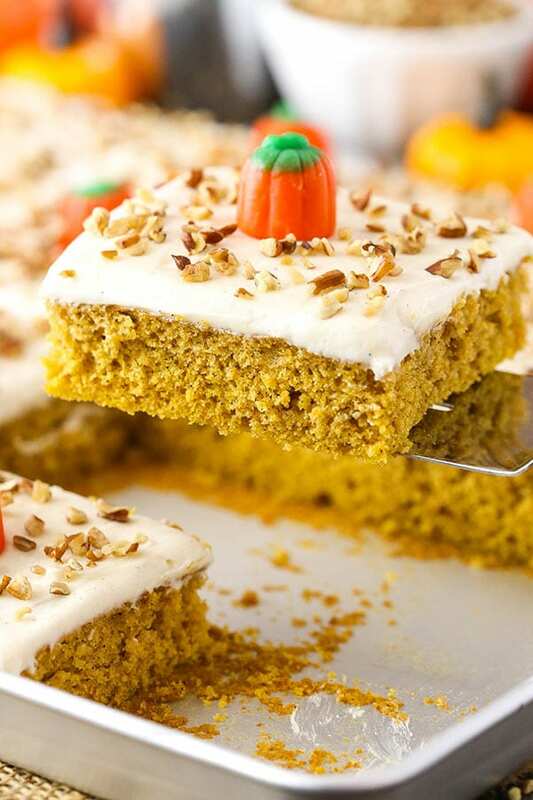 To get started with this pumpkin sheet cake, you’ll cream together the butter, sugar and a little bit of vegetable oil. I love that this cake uses both butter and oil – it’s the best of both worlds. Butter for flavor and oil for some extra moisture. 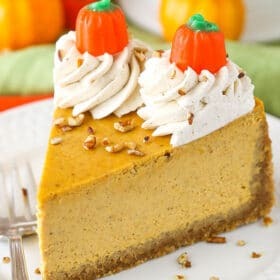 And of course when it comes to pumpkin, I love to use brown sugar. If you find your brown sugar tends to have little lumps in it, I’d suggest sifting it first. Next up are the eggs, which give additional moisture and structure to the cake. Then a little vanilla for flavor. Your dry ingredients are added next and here we use all purpose flour and a little baking powder and baking soda. There’s also some of my favorite spices of season – cinnamon, nutmeg and cloves. 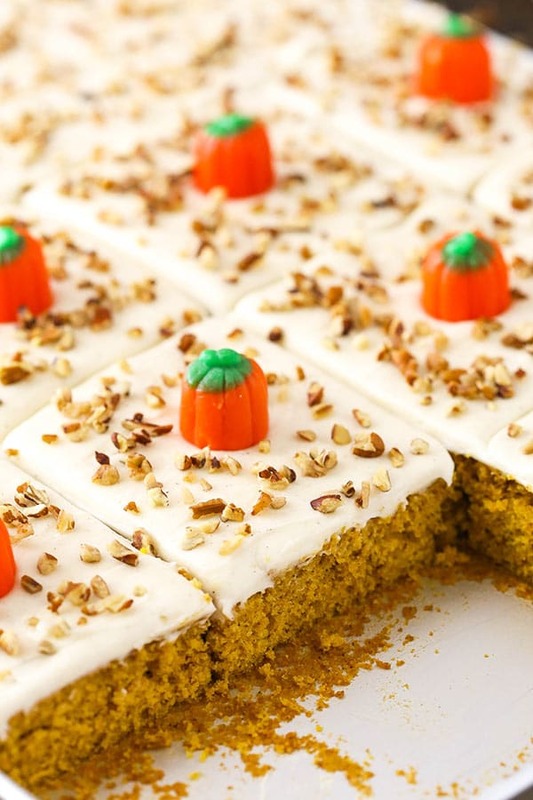 The dry ingredients are added alternatively with the pumpkin puree. Be sure to use actual pumpkin puree (I used canned) and not pumpkin pie filling. We are using a full one and fourths cups of pumpkin here, so there’s lots of pumpkin flavor for all us pumpkin fans! When the cake has baked and cooled, it’s covered in a light cinnamon cream cheese frosting. It’s just the right amount of frosting to not overwhelm the cake and it all goes perfectly together! 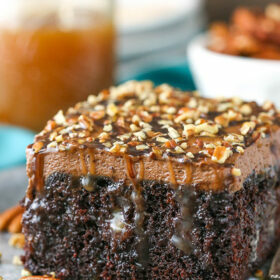 I’m so excited to have this cake in my back pocket for gatherings when I need something quick and tasty! I hope you love it too! 10. To make the frosting, beat the butter and cream cheese together until smooth. 12. Add the vanilla extract, cinnamon and milk/cream and mix until smooth. 13. Slowly add the remaining powdered sugar and mix until smooth. Add additional milk, if needed to get the right consistency of frosting. 14. 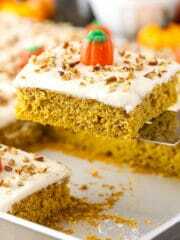 Spread the frosting evenly onto the cooled cake and then top with chopped pecans and pumpkin candies. Cover the cake and refrigerate until ready to serve. Let cake sit out for at least 20-30 minutes to warm up a bit before serving. Cake is best when eaten within 3-4 days. Hi Lindsay….I want to make this recipe but I have some questioins. You list in the cake ingredients a teaspoon of vanilla but I don’t see where it is in the instructions. Also # 6 of your instructions just says “Pumpkin puree and mix until well combined”….I think something is missing here. I have one more thing to ask in the frosting section. #11 says “Slowly add half of the powdered sugar and the salt and mix until smooth”. I don’t see salt listed in the ingredients so I don’t know how much salt or shouldn’t salt be listed? Please reply. Thank you. This looks so delicious! Sorry for the confusion! I’ve updated the recipe to clear that up. Thank you! I hope you enjoy it! Why won’t it let me print the recipe? Try this link. Hope this helps! I love to make sheet cakes and am so glad you are adding more recipes. Not only is assembly easier and faster, but decorating is also less stressful. Additionally, it always feels safer transporting something flat! 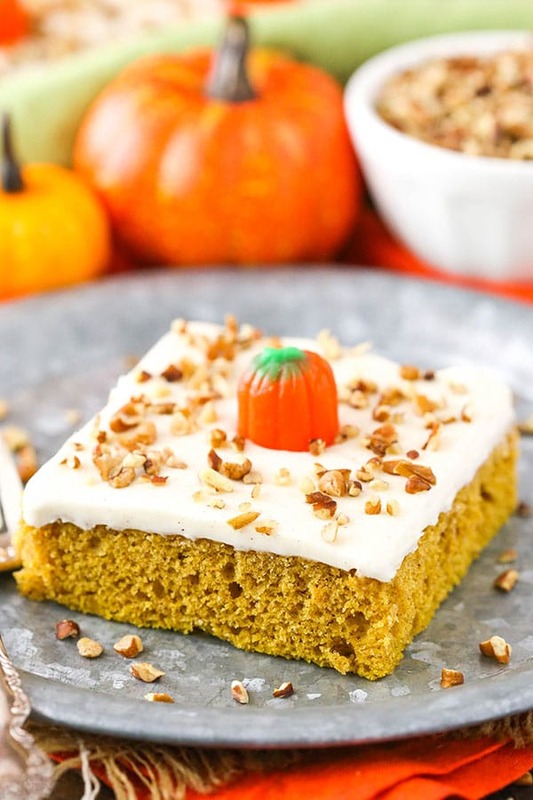 I particularly love the cake to icing ratio in this Pumpkin Sheet Cake (by using a 12×16 pan), allowing us diabetics the opportunity to eat “just a piece” of cake instead of an entire slice of layer cake! After revisiting this recipe, I realized the pan size is 12×18 (not 12×16) and horrors, my “old” wall oven will not accommodate this size. I do know that Wilton makes an 11×15 pan but, aside from having a little left over batter, will I need to adjust the baking time? Most of the sheet cakes I’ve made previously were 9×13 (a more significant difference), but I would really like to transition to the “thinner” depth. Thank you so much for another great recipe that was very well written and resulted in a moist and delicious cake. This was a huge hit for a gathering in addition to another layer cake I made that used two layers if your vanilla sheet cake (also so moist).